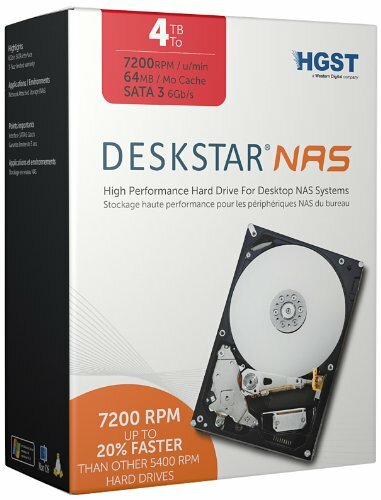 Home › Electronics › Hgst Deskstar Nas 3.5-Inch 4Tb 7200Rpm Sata Iii 64Mb Cache Internal Hard Driv..
Hgst Deskstar Nas 3.5-Inch 4Tb 7200Rpm Sata Iii 64Mb Cache Internal Hard Driv..
Capacity: 4TB HGST (formerly Hitachi Global Storage Technologies) is a new type of storagecompany designed for a new world in which ever-increasing amounts of contentare being generated from cloud services, Internet content providers, socialnetworks and mobile devices. HGST has an unmatched reputation for reliabilityand offers a broad portfolio of innovative, high quality hard disk and solidstate drives that store, manage and protect the world's data. Our drives arerelied on by enterprises, Internet companies, consumers and creativeprofessionals to store and manage their data efficiently and securely.